Process owners and business owners can use this solution to engage directly in the improvement of their business processes. IBM BPM excels in integrating role-based process design, and provides a social BPM experience. It enables asset sharing and creating versions through its Process Center. The Process Center acts as a unified repository, making it possible to manage changes to the business processes with confidence. IBM BPM supports a wide range of standards for process modeling and exchange. Built-in analytics and search capabilities help to further improve and optimize the business processes. 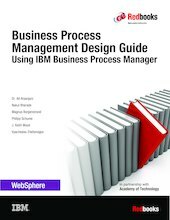 This IBM Redbooks® publication provides valuable information for project teams and business people that are involved in projects using IBM BPM. It describes the important design decisions that you face as a team. These decisions invariably have an effect on the success of your project. These decisions range from the more business-centric decisions, such as which should be your first process, to the more technical decisions, such as solution analysis and architectural considerations.